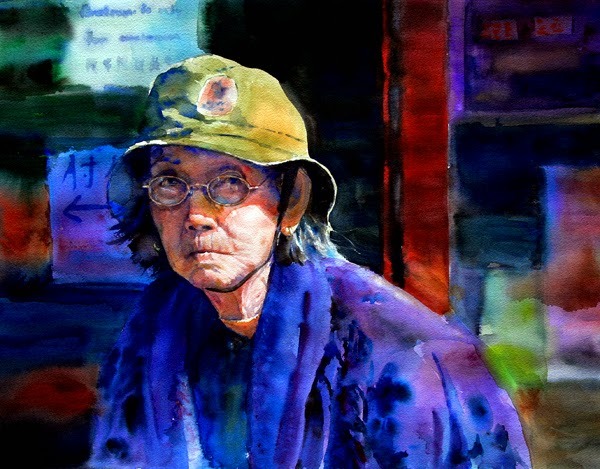 Peggi Habets Studio: New Watercolor "Mei Hu"
This is a watercolor demo from one of my workshops. I titled it Mei Hu, which means plum tiger. Funny story, I showed this demo in a recent workshop and one of my students pulled out a photo of the exact same woman, who lives somewhere in San Francisco's Chinatown district. Neither one of us know her; we just happened to be in SF separately and we both took her photo. Drawing from the busy signage behind the figure, but I decided to paint shapes and values instead of specific details. This creates a suggested, but not specific, location and lets the figure come forward as the focal point. I cropped to a horizontal format because her expression was what drew me to her in the first place. My color triad is blue violet, red orange and yellow green, with the dominant color being blue violet. All my colors were mixed from eight colors: Phthaylo blue, Ultramarine blue, Raw sienna, Bismuth yellow, Quinacridone violet, Quinacridone Rose, Maroon Perylene, and Sepia.